This multi-phased (three GMPs), award-winning project included the installation of 17,634 LF of 18", 20", and 22" HDPE sewer force main by utilizing open excavation and horizontal directional drilling (HDD). 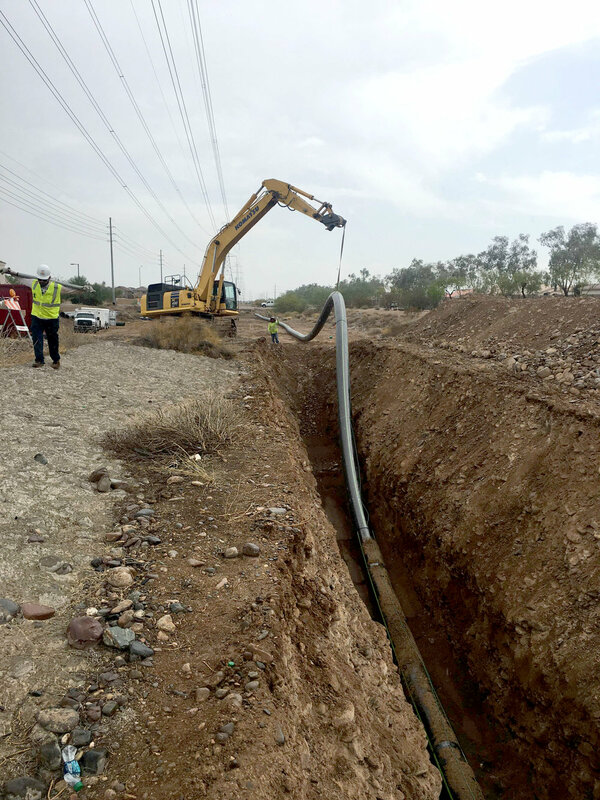 HDD was used at three different locations including 1,600 LF crossing under the Agua Fria River. The scope also included the installation of 400 LF of 18" and 24" storm drain, line valves (4 each 18"), air release valves (2 each 2"), modifying one existing vault, and 694 square yards of asphalt (remove and replace). The project team coordinated with numerous public and private stakeholders, and completed design and construction within an accelerated twelve month time frame, all while maintaining operation of the existing 2.5 MGD wastewater system. 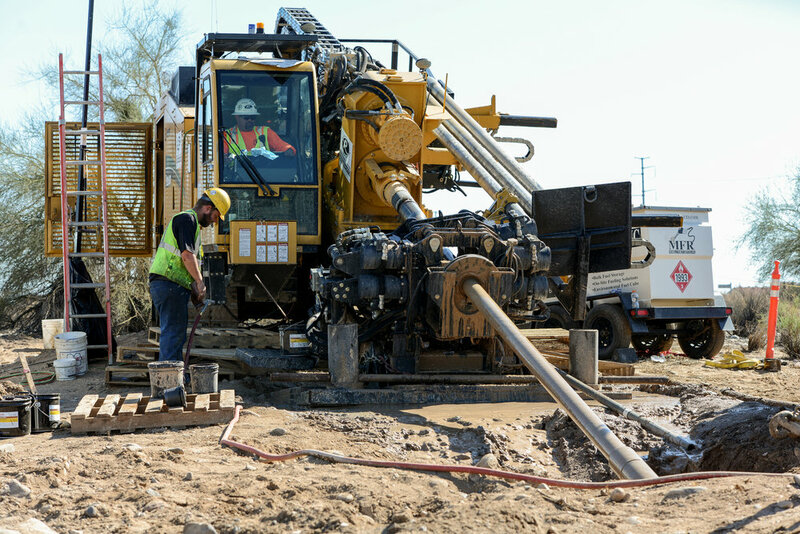 The pipeline alignment starts at EPCOR's Northwest Valley Regional Water Reclamation Facility northwest of at Beardsley Road and 111th Avenue and goes south and west and ending at the existing lift station at Bell Road and El Mirage Road. 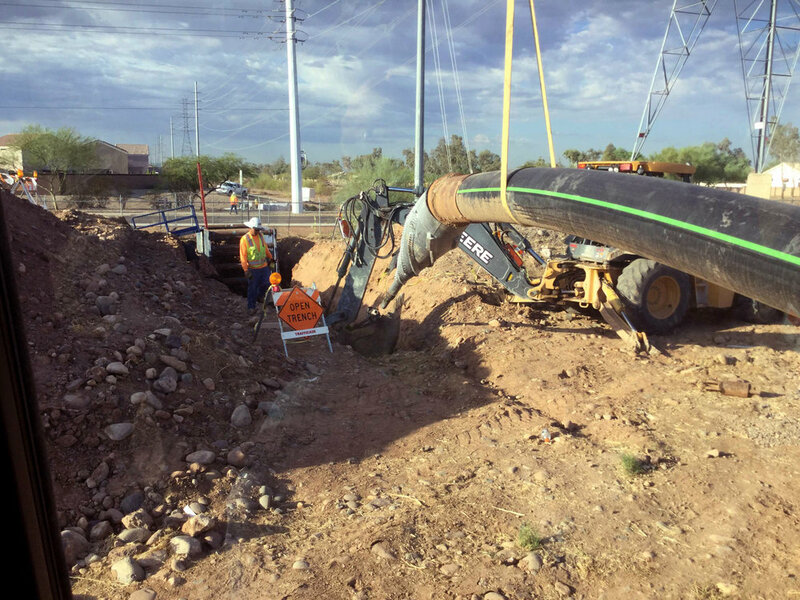 Achen-Gardner coordinated with EPCOR Water, City of Peoria, City of Surprise, and Maricopa County to ensure this project's quality, schedule, price, and safety expectations were exceeded. Coordination also included ADEQ, United States Army Corps of Engineers, ADOT, Arizona State Land Department, APS, TEP, Maricopa County Flood Control, Maricopa County Environmental Services Department, numerous third party utility companies, and business/residential stakeholders. Our award-winning Bell Road Force Main CMAR project was recognized by Water & Wastes Digest as one of their 2017 Top Projects. They produced this video about the project that features Chad Talbot (EPCOR Water Engineering Project Manager), Dan Spitza (Achen-Gardner Construction Vice President), and Frederick Tack (GHD Senior Civil Engineer). This is a great video that highlights the project team's challenges and the planning and hard work that went into the successful completion of the project. Thanks to Water & Wastes Digest for producing this video and allowing us to host it on our website.